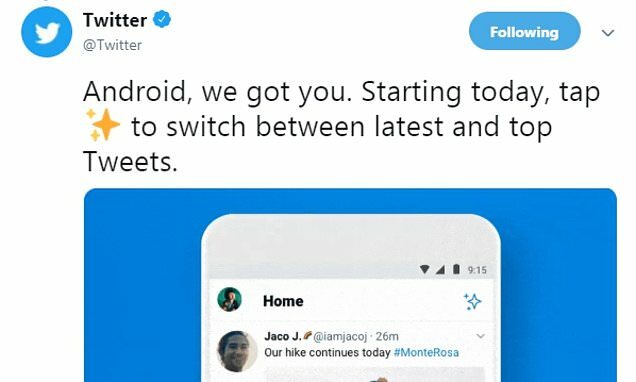 Twitter is finally resurrecting the chronological timeline for Android users - over a month after iOS users got the feature. Just as on iOS, users will soon see a button on their timeline that allows them to switch between seeing the most recent tweets and top tweets. 'Android, we got you,' the firm said in a tweet. 'Starting today, tap (star) to switch between latest and top Tweets. The social media giant announced the update in a tweet late Wednesday. 'Sometimes you want to see the latest Tweets, first,' the firm wrote. 'We're testing a way for you to make it easier to switch your timeline between the latest and top Tweets. 'Starting today, a small number of you will see this test on iOS,' Twitter added. A preview of the feature shows a sparkle icon in the upper right corner of the timeline. When users click on it, it gives them the option to toggle between two different types of timelines. Choosing to view it based on top tweets will organize posts on the timeline based on things like accounts users interact with most or tweets they engage with. Switching back to latest tweets will show posts based on recency.